In half the time of traditional development approaches, OutSystems consolidates multiple, highly-complex processes into a unified system for managing artists’ rights payments. 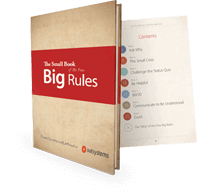 After three failed attempts building with .NET and facing a twelve-month regulatory deadline, OutSystems was identified as the only provider capable of delivering the complete solution on time. OutSystems deployed the first version in six and a half months, and within a year, PlayRight achieved an unprecedented level of efficiency by automating their complex payment processes. 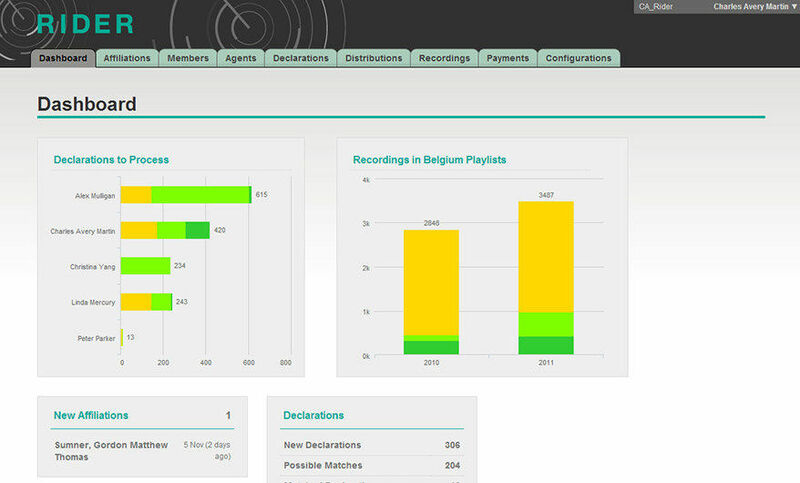 PlayRight is a Belgian collective management organization that collects and distributes rights on behalf of thousands of musicians and artists worldwide. Managing and distributing rights to thousands of members and partner organizations is a complex undertaking requiring tremendous accuracy and handling of large volumes of data. The ‘comparison’ process alone requires making billions of matches from playlists to repertoires. PlayRight was using a variety of spreadsheets and databases to manage individual components of rights management. This manual process was cumbersome, prone to errors, and expensive, and the risk to members was a loss of rights’ payments. Three unsuccessful attempts were made at creating a consolidated system using traditional technology approaches. With growing demand and increasing data volume, meeting deadlines was impossible. Under regulatory pressure, PlayRight needed to restore a trustful and transparent relationship with members within a year’s time. There was no package available, and this was a highly-complex mission critical application that needed to be built from scratch. During the vendor selection process, an International Consulting Firm estimated two years to complete the project but ultimately withdrew from consideration when faced with the overwhelming complexity and risk. After looking at various vendors, OutSystems Platform was chosen as the solution to tackle the complex integration and quickly deliver a consolidated system that solved PlayRight’s growing problems - on time and at a fraction of the cost. In just six and a half months, PlayRight rapidly developed and deployed their Single Customer Portal, and within six months, they began launching components of RIDER, their core system. In just under a year, all of the web application functionality was fully operational. 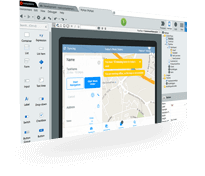 Both projects were developed using the high-productivity OutSystems Platform and an agile development methodology. Together, RIDER and the Customer Portal comprise several fully integrated web business processes that have dramatically improved business performance by integrating core processes with accounting and their financial institution. The PlayRight Neighboring Rights Management System project was a huge success in terms of customer and internal team satisfaction as adoption by users far exceeded initial expectations. In just under a year with OutSystems, PlayRight delivered a comprehensive core system that automated and consolidated multiple complex functions and a single customer portal for streamlined communications between members and the collective management organization. Moreover, from a business perspective, PlayRight came back from the verge of disaster brought on by the complex nature of the collective management industry, the massive volumes of data they handle, and various systems needed to operate the business. Performers can self-register online to become PlayRight members. The back office contains an approval workflow to ensure all required conditions are met. Performers and agents use the portal to manage their repertoire and profile by submitting their declarations of sound recordings and/or audiovisual works. In addition, the portal offers a complete overview of a performer's rights and allows performers to track payments and relate the payments with the repertoire. Partner societies use the portal to exchange information with PlayRight. Playlists can be downloaded and claims uploaded. Exchange formats include Excel and SDEG XML files. For those societies that do not have a local matching system, the portal offers this service through a very simple interface. Manage Contracts: Includes the approval workflow of contracts between PlayRight and their members. In addition, the day-to-day operations regarding members management are centralized in this system. 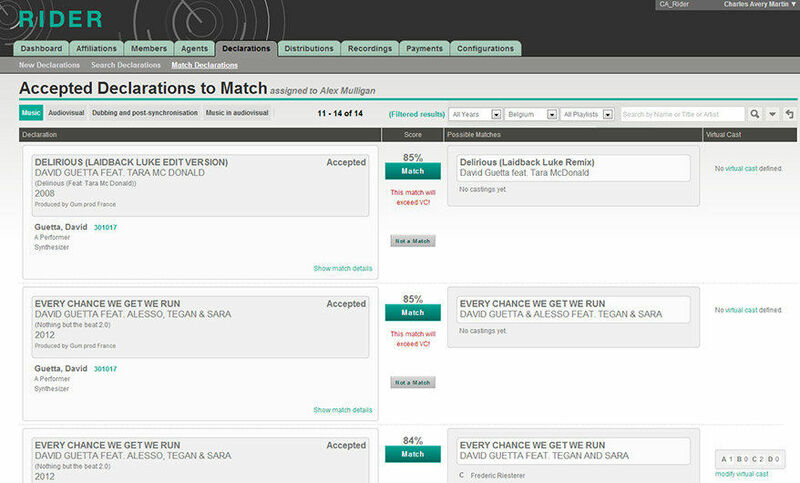 Match Repertoire: This process presents matching algorithm results. It matches repertoires to international playlists - reducing the claiming process from months to a few weeks or less. Determine Rights Distribution: Calculation of rights is determined according to rules applied for certain referenced years. 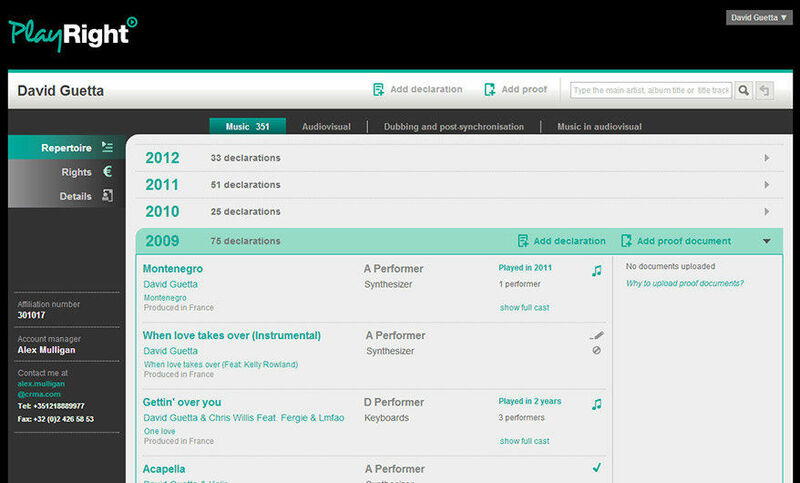 In a matter of minutes, the system calculates and presents the rights that a performer has earned according to his repertoire and the specific playlist year. View Communication and Payment: After a distribution is calculated, performers or their representatives need to be notified and paid. The module enables integrated communication and payment. 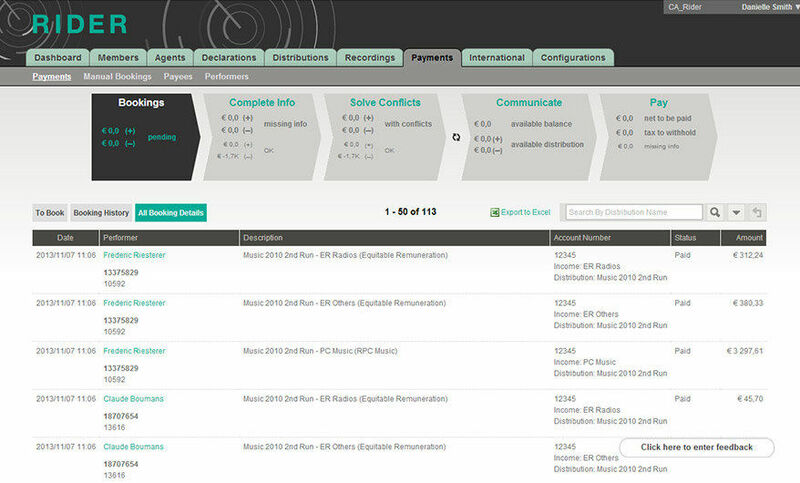 Users can view a history log of all sent communication or paid amounts.